More than 38,000 fans of reining and driving descended on the 2006 World Equestrian Games on Friday to watch the exciting marathon phase of four-in-hand driving and the Team medal competition in the Western discipline of reining. It was a Gold-medal day for Team USA’s reiners, while three American drivers took to the challenge of the expansive and difficult cross-country and hazards phase. Some would say we saved the best for last, and the raucous reining fans would certainly agree. With the sun shining brightly for the first full day of these World Equestrian Games, spirits were high as were hopes for the U.S. keeping their Team Gold. Reining makes its second appearance at the WEG, after a Gold-medal win for the U.S. in Jerez, Spain, in 2002. Today’s Gold medal victory showed the world that the U.S. still proves to be the team to beat, scoring 664.5. All four U.S. riders will return Sunday for the individual competition. Lots of yelling, hooting and hollering led the way for America’s first rider, Dell Hendricks, of Tioga, TX, who took to the arena with Starbucks Sidekick, a six-year-old Quarter Horse stallion, owned by Adair Reiners, LLC. Hendricks and Sidekick took the lead with a score of 219. Just four riders later, Canadian Lance Griffin repeated Hendrick’s score. Hendricks has a special bond with his gray partner; Sidekick’s grandmother took Hendricks to his first career reining win. He had nothing but praise for his mount today. Aaron Ralston, of Silt, CO, and his 12-year-old Quarter Horse stallion, Smart Paul Olena were the next Americans to go and retook the lead with a score of 223 and sliding stops that had the crowd holding their breath and then screaming for more. However, there was a tense moment for the crowd when Paul slowed to a lope for his second small circle that was almost a halt. However, Paul did not falter, earning the American’s highest score. The horse he calls Paul, has been a member of the family since wife Meg purchased him a few years ago. They purchased him from a family that had a ranch on a mountain where Paul was turned out for four to five years with about 30 to 40 broodmares and also did some ranch work. Ralston tried to get some of his clients to buy him, but no one wanted to take a chance on a horse that had been out of commission for so long. Third up for the U.S. in the team competition was reining legend Tim McQuay of Tioga, TX, riding Mister Nicadual, a six-year-old Quarter Horse stallion, owned by Jerry Kimmel. McQuay did not fail to impress, and his score reflected that—a 222.5, putting the U.S. in a nice spot for a team medal. Despite the screaming crowds, McQuay praised Mister Nicadual for always knowing his job. McQuay thanked his horse and mentioned what a special mount you have to have in this sport to be successful. The final U.S. rider was Matt Mills, who posted a career-high 231.5 at the selection trials, and was today’s team anchor. Mills is the team’s youngest member at 27. Ironically, he first apprenticed for teammate Hendricks, who taught him much of what he knows. Mills and Easy Otie Whiz, a seven-year-old Quarter Horse stallion, owned by Out West Stallion Station and Bobbie Cook, posted a score of 217.5 which the crowd was not happy about. Everyone competed today where the team honors were decided, with the top 20 riders returning on Sunday for the individual competition. In today’s competition, reiners performed pattern eight, and the three highest scores were taken into account for the final team rankings. The top 20 individuals will move forward to Sunday’s individual competition where they will perform pattern nine. Alternate Tom McCutcheon also made the trip to support his team. 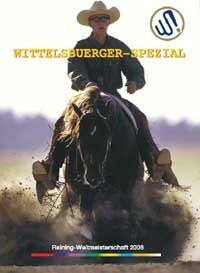 McCutcheon was a member of the first WEG Gold medal-winning reining team and also the Individual Silver medalist. Another regular from the 2002 WEG was reining team chef d’equipe Jeff Petska, who was very complimentary of his team. The 2002 FEI World Equestrian Games were the debut for reining, and the sport continues to be the fastest growing discipline recognized by the FEI. This year, 68 reiners from 21 countries are vying for the highly sought-after medals, of which the U.S. took three in 2002, a Team Gold, Individual Gold and Individual Silver. 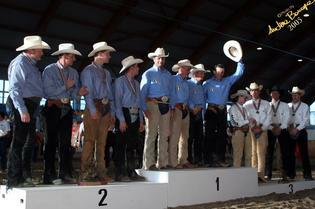 At reining’s debut four years ago, there where 11 countries represented, nine with full teams. Competing against the U.S. today with full teams were Austria, Belgium, Brazil, Canada, Czech Republic, France, Great Britain, Germany, Israel, Italy, The Netherlands, Switzerland, Slovakia and Sweden. Countries with individuals competing are Denmark, The Dominican Republic, Hungary (2), Mexico, Norway (2) and Poland (2). Putting in the top score of the day—a 225.5—was Canadian, Duane Latimer, former trainer of Mills’ horse Easy Otie Whiz. Latimer was also a member of the Silver medal winning Canadian team whose final score was 664. Earning the Bronze medal today with a score of 656 was the Italian team. After the victory gallop, as a grand finale, the Americans performed spins in unison which made the crowd go wild. The jog was held Thursday and two of the horses held for re-inspection did not pass, one from Germany and one from Denmark. Today was also an unlucky day for the Dominican Republic’s sole rider who broke pattern, touched both reins and took the wrong lead, giving him a score of 0. Five more riders zeroed out by the end of the competition, one from Slovakia, Brazil, Belgium, Israel and Canada. Europe´s leading western website - click here!